The joys of being sick! 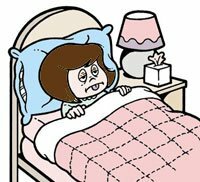 Wouldn’t you know it, with only 2 days of leave left and nothing at all planned for the rest of my holiday, planning to be footloose and fancy free, I have come down with the flu! Just what I need! You have a legitimate excuse to mope around the house all day in your pyjamas. There are actual benefits to staying in bed ALL day! All that sensitive skin gives you a reason to get naked in bed, like you need a reason, but whatever! If you have a fever, you’re allowed to stuff your face, after all, you’re supposed to feed a fever. If you just have a cold, you have the perfect excuse to detox, ‘cos you’re supposed to starve a cold. Anytime you’re asked to do anything, you can say, “No, I’m sthick!”. Knorr Chicken and Mushroom Cup a Soup is NOT actually edible! Come on now! Taking 12 Viral Choice tablets the size of a small vehicle, and 24 000 mg of Vitamin C does diddly squat to improve matters. Walking around the centre with no makeup on and looking half dead in a green tank top and pink jersey WILL get you lots of squiff looks, DEAL with it people, I’m sthick!